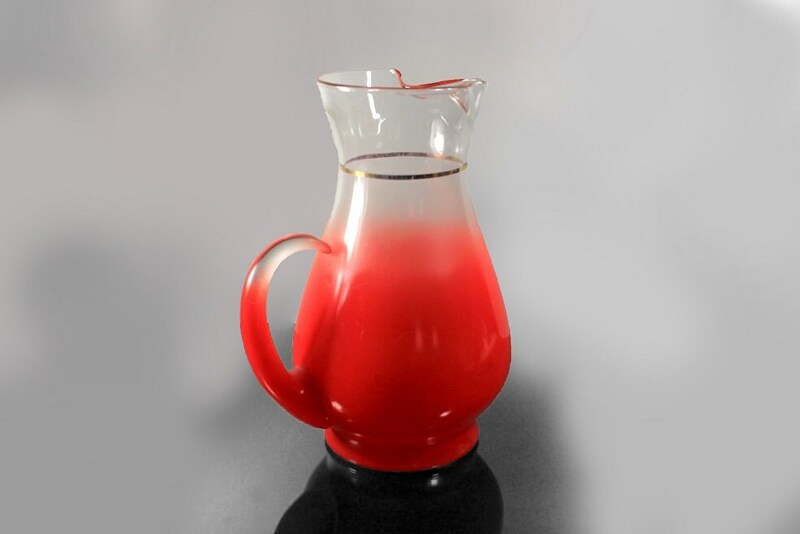 A 2-quart pitcher in the Blendo pattern by West Virginia Glass Specialty. The pattern consists of frosted red glass with a gold rim. 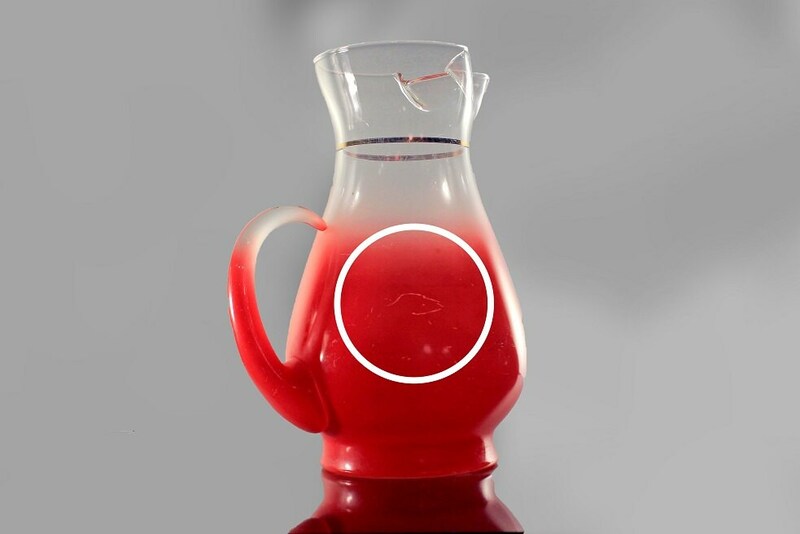 Blendo is a specialty line of mostly pastel glassware started by West Virginia Glass Specialty in 1955. 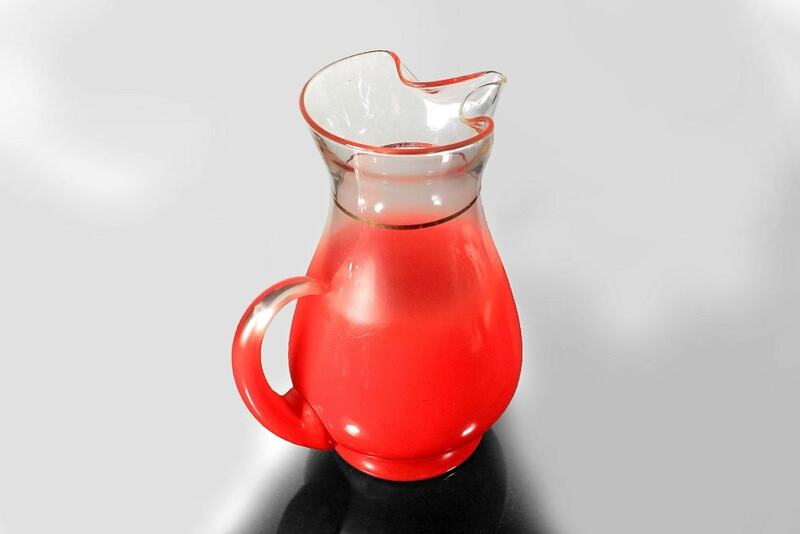 This pitcher is from the early 1960s. It would be beautiful gracing a home bar, a man cave, or for a summer afternoon on the veranda or patio. 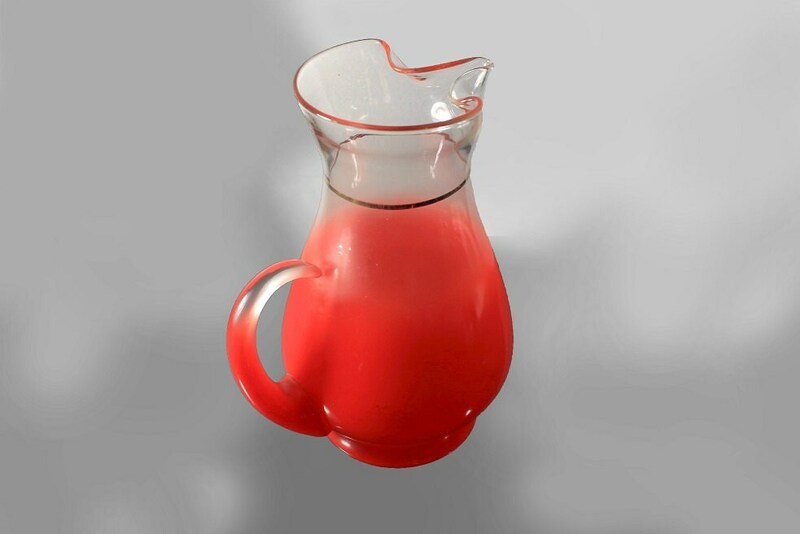 It would be fantastic for serving a number of different drinks such as lemonade, iced tea, juice, or sangria during spring and summer months. Blendo glassware was a staple at summer barbecues during the era when rock music reigned and rockets were racing to the moon. The Blendo line, manufactured by the West Virginia Specialty Glass Company, was at the peak of its production in the 1950s and ‘60s. Blendo came in a wide variety of colors. Known for its frosted solid base that fades as it goes up the glass and a gold rim. 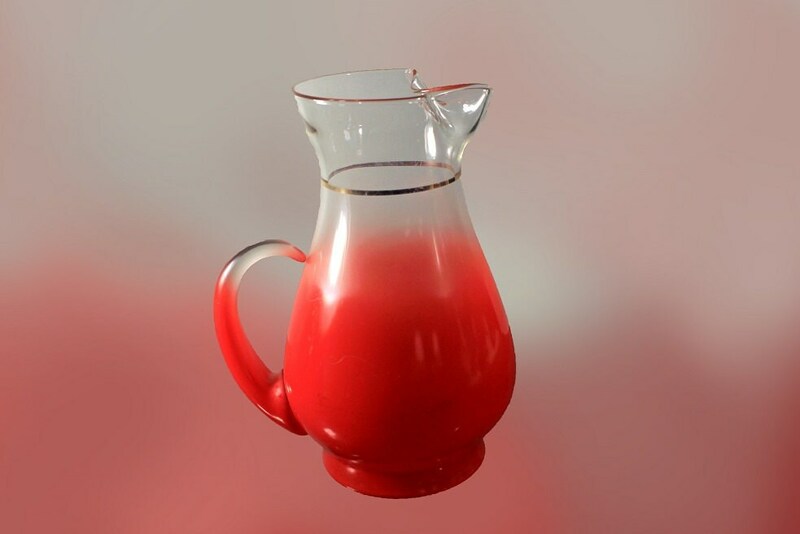 This pitcher is in very good condition. There are no chips or cracks. There is scratching to the frosted area which is not uncommon from being used and loved over the years. There is one larger scratch noted in photo 5. The gold trim does show some wear. Our price reflects these. These would make a great gift for a wedding, housewarming, holiday, or special occasion. Or a great addition to your own kitchen, barware, or man cave. Gorgeous pitcher! It arrived exactly as described, just in time to hold a family-sized bloody mary for my pre-Christmas brunch this weekend. The small scratches don't detract from the amazing style and the seller was more than reasonable with the pricing, even refunding shipping overages. I would definitely buy from this seller again in the future.